One of the most common questions we hear at EU Juicers is “Why is the locking collar on my Sana 606 or 707 difficult to turn?” Fortunately, the solution for this is simple. 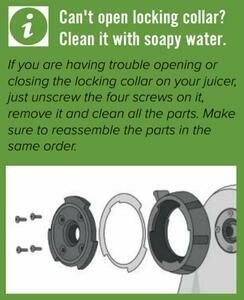 Over time, deposits from juicing can slowly build up behind the locking collar. These can cause stiff movement of the collar when putting on or removing the juicing assembly. The solution is to remove the collar and clean behind it. To remove the collar, first remove the juicing assembly from the base unit. You will see four screws attaching the collar and the central locking disc to the base. Remove the four screws with a Phillips screwdriver. Then pull off the black collar and the grey inner disc. (Note that some models may also have a thin metal gasket between the collar and locking disc.) Clean any deposits from the base unit with warm soapy water. Do the same with the black collar and gray inner disc, using a sponge or washcloth. Carefully dry the collar and gray disc, insert the locking disc into the collar (and metal gasket if equipped), and attach it to the base unit using the four screws. You should see an immediate improvement, with the collar now opening and closing freely.